And suddenly we were holding small chicks in our hands, sitting on a couch of a family in a small village somewhere in Romania. Shortly before that we were preparing our breakfast in the middle of said village. We had spent the night nearby but chose to leave that wildcamping spot because the high grass was still moist in the morning. The days were always quite hot and sunny but also came with almost daily thunderstorms. This meant that especially in the mornings the moisture would condense on the ground. The owner of the house behind the bench we were having breakfast on saw us and promptly invited us into his house. He turned out to be the local priest who lives here with his wife and four children. 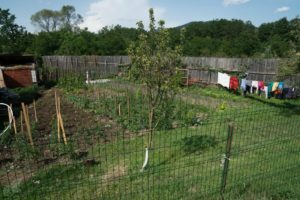 Like many others in Romania they had their own small garden and some animals, mostly chickens. Some chicks were born just the other day and each of us got to snuggle with these tiny fluffy creatures. Soon all of the children got themselves one as well, some being gentle and others a bit rough. Both parents had studied in Cluj and could speak some English and therefore we could have a conversation about the country and its people. During our journey through Romania we’ve been approached by locals many times, often the communication was challenging though, because we speak neither Romanian nor Hungarian – the latter being the first language of a minority living in Transsylvania. Sometimes though we met people who had spent some time abroad and learned a second language there. Like the elderly man we met in a small village who was proud to show us around his house and garden full with chicken and who filled our waterbottles out of his well. He had lived in Paris and thus French was our common language. Another man stopped us on our way and after a short conversation in broken German he went on to show us his village and the workshop of his son. The son constructs milk automats and sells them in Switzerland so his father thought that Samuel (being Swiss) has to be interested in them. It’s a Swiss-Romanian project he repeated over and over again. The encounters were sometimes touching and oftentimes amusing. On our way through yet another small village – Romania is full of these – a man stopped us and began preaching about his faith. It was important to him to stress the necessity to act and to take care of the people around oneself instead of simply attending mass each Sunday. 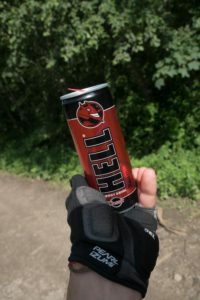 In the end he gave us an energy drink called hell, which we found rather funny. 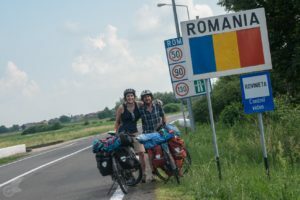 About ten days ago we entered Romania from Hungary and since then we dived into the manifold and all too often simple life of this country. It is a peculiar feeling and experience to slowly move away from our well-known environment and to discover a reality bit by bit, that at least partly works very differently from the one we know. At the border we were controlled for the first time and we realized that, even though we were still in the European Union, we had left the Schengen Zoone behind us. That meant an end to open borders as a basic principle. But much more fascinating than that is to witness how life is for many people here, at least based on what we can see from the outside and what we can ask them about. 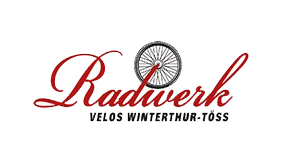 To some extent it feels like a time travel to about 60 years in the past. On the roads we encounter horse carriages time and again. These carriages seem old because of their wooden construction but the car wheels betray their modern design. We often find wells, sometimes with a rope winch, other times with a long arm to lift the water from the deep hole. Some of the wells seem to be drilled and have pipes sticking out or even a tap. From such wells we got water a few times and it tended to taste much better than the water out of old pipes in the cities. Apart from the chicken we encountered many other animals, frequently just on the side of the road. 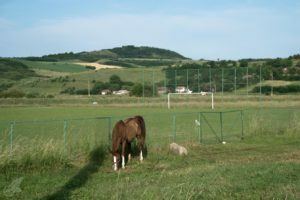 We saw horses tied to poles in the fields or cows who grazing their way along the road. It was interesting to see huge sheep flocks accompanied by shepherds and their dogs. We were told that especially in the mountains many shepherds have multiple dogs who protect their flocks from wild animals like bears. In contrast life in the cities seemed to be modern. We spent two nights in Cluj, which is a town of roughly 400’000 inhabitants including 150’000 students. That became very obvious when we were exploring the town and saw young people absolutely everywhere. The town has countless little cafés and once again bigger supermarkets. But the gardens and wells had disappeared. So the life here constantly shows us the contrasts between past and present age and we are looking forward to discovering the country further. At the moment we are spending some time with Berni and her family before we will continue towards the Black Sea crossing the Carpathians. Thank you to all people we met on the way for their hospitality and their curiosity. We hope to have a good journey or “Drum Bun”, as the Romanians say.